Hello all, Well I am sure it really hasn’t been that long since we wrote, but it feels like a long time. So much has been happening. The New Canoe- Well Jesse has finally gotten his wish and we now have a new canoe, made especially for the work we have to do. The good people of Tamo gave us the tree for the canoe in exchange for help from our chainsaws to work on a canoe of theirs. 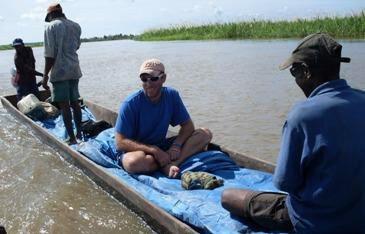 And for the price of a piglet we were able to get an expert carver to make us a good canoe. It is 48ft long and 38in across at it’s widest point. It will hold between 2 1/2- 3 tons of supplies at a time. This is vital since we bring our fuel in by river as well as construction supplies. Registered School- On Jesse’s latest trip to Wewak to pick up cement bags, he took the board members of our small Elementary school to open a back account. This was the last step needed to finish our application for registering our school with the provincial government. We are waiting for our official number which should be issued in September. Pouring the footers- Tomorrow, May 18, Jesse is planning to pour the four corner pads for the new sanctuary/literacy center (and yes I know we need a new name for this building). This is a big step and lots of people are planning to be there for the foundation laying. We will take pictures and try to attach before sending this. In the meantime- During all of this our pig has had piglets (most of which died in the night) since we didn’t know she was laboring. The four surviving piglets are 2 weeks old and doing well. I have planted one rice field and harvested another. After my first milling I got nearly 20kg or 40lbs of rice. This is great since we are going to be having guests shortly. Guests- Please be in prayer in for the great number of guests and events coming up. Here is a brief coming and going schedule for the next 2 months. “You are anemic, and if something would happen during delivery we just wouldn’t be able to help you. You need to have your baby in the hospital,” our nurse told one mother. A month later she was back at the clinic after a risky home birth. The nurse came to me and explained, we referred her to the hospital but the nurses there sent her back home. They said her chances were better delivering at home than allowing the doctors there to operate on her. “What do you want me to do about that?” she asked me. I didn’t have the answers she was looking for. There isn’t anything we can do, we can change things here in the village; we can have the best equipped and best staffed clinic, but after we refer the patients out, they are out of our hands and we can’t do much to help them. It is the same with our school I told her. We just got the elementary school registered and we are getting ready to send our first group of 2nd graders out to the local primary school next year but here we are in the 15th week of school and the primary teachers haven’t started up school yet after the first term break. We can prepare them, but we can’t ensure their success since we don’t have control over the upper grades. In some ways this feels like a lesson in futility. But then again we see the opportunity to plant new seeds in this fertile ground that is ready for change. Like the building project, the foundations must be laid. And the small things we begin here may not be enough to satisfy us yet, but they are a vision of what could be. We hope to prove faithful in the small things so that one day we may see our efforts grow.